Registration fee includes full attendance, syllabus, and lunch. Registrations are accepted online until 11:59 pm ET August 22, 2014. To register after this date you must do so on-site. Only clinicians and qualified clinical staff can be admitted. Nonqualified spouses or guests will not be admitted. In compliance with the Americans with Disabilities Act, Joslin Diabetes Center will make every reasonable effort to accommodate your needs during your attendance at this activity. For any special requests, please contact Joslin Diabetes Center at cme@joslin.harvard.edu. This activity has been submitted for independent commercial grant support. A handling fee of $25 is deducted for cancellation before Friday, July 25, 2014. The two main entrances to Joslin (denoted with yellow triangles on the map below) are located on Pilgrim Road & Joslin Place. Note: the Pilgrim Road entrance to Joslin is locked on Saturdays. You will need to enter the building on Joslin Place. 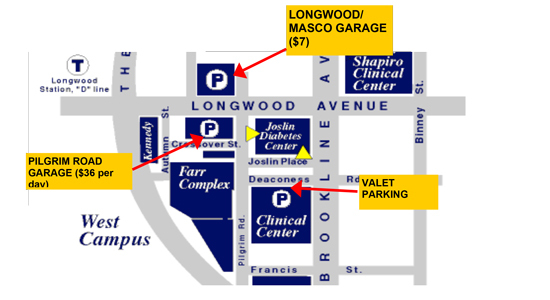 The Longwood Garage is located at 375 Longwood Ave, one block from the Joslin Diabetes Center. Directions: From Longwood Ave, turn left onto Pilgrim Road. Take the first right onto Crossover Street. Valet parking is available from 8 a.m. to 9 p.m. in front of the BIDMC – West Campus building (One Deaconess Place). Directions: From Longwood Ave, turn left onto Pilgrim Road. Take the 2nd left onto Deaconess Road and proceed to valet parking drop-off.